Higashiniigata MG-42 Well Drilling | Our Business | Mitsubishi Gas Chemical Company, Inc. The Higashiniigata Oil-Gas field is located in the near shore waters of the Agano River of Niigata City. Our company, originally Nippon Gas and Chemical Engineering (Corp.), was founded in Niigata in April 1951 for the purpose of manufacturing chemical products such as Methanol and Ammonia to use natural gas as the raw material. However, for this it was determined necessary to independently own a gas field, and so land and offshore mining rights for the area near the Higashiniigata Oil-Gas field were acquired. 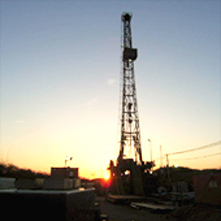 From 1956, our company has proceeded to develop the natural gas dissolved in water and the non-associated natural gas existed in a shallow portion (to a depth of about 600m) in this area, drilling around 100 wells. Higashiniigata Oil-Gas field, a non-associated natural gas field deep beneath our company’s Niigata Plant, were discovered in 1959. For about 50 years since then, we have been proceeding with exploration and development in cooperation with Japan Petroleum Exploration Co. Ltd. The natural gas produced from the Higashiniigata Oil-Gas field is a reliable source of raw materials and fuels used by our Niigata Plant for the production of chemical products. 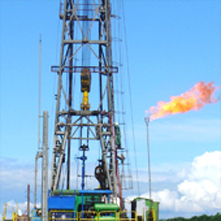 Also, since 1981, our company has resumed independent exploration and development targeting the non-associated natural gas which exists in a relatively shallow part of this Oil-Gas field. 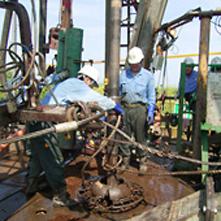 MG-42, the 22nd exploratory well, began drilling on August 28, 2006. After drilling through its initial target of the sand stone formation at a vertical depth 1000m–1400m, it finished on September 11, at a total depth of 2000m. However, we were unable to confirm the production potential of the gas in this sand stone formation, and so a sidetracking well drilling (a branching well drilling from the middle portion of the original well) was rapidly implemented. As a result, we succeeded in finding a new gas formation southwest from the original well, and confirmed the potential for natural gas production.